Two domains. Residue ranges: 1-75 and 76-154. 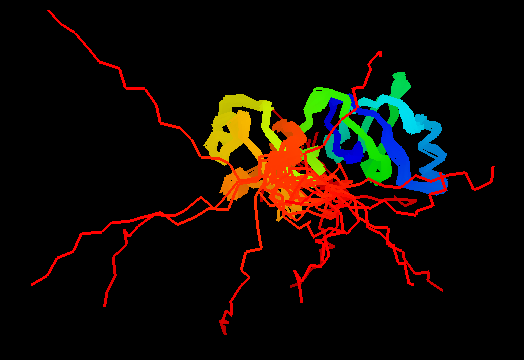 PDB range matches target sequence range. Unambiguous domain boundary. Poorly structured C-terminus. Structurally variable region was removed from NMR models for evaluation of predictions. Correlation between weighted by the number of residues sum of GDT-TS scores for domain-based evlatuation (y, vertical axis) and whole chain GDT-TS (x, horizontal axis). To compute the weighted sum, GDT-TS for each domain was multiplied by the domain length, and this sum was divided by the sum of domain lengths. Each point represents first server model. Green, gray and black points are top 10, bottom 25% and the rest of prediction models. Blue line is the best-fit slope line (intersection 0) to the top 10 server models. Red line is the diagonal. Slope and root mean square y-x distance for the top 10 models (average difference between the weighted sum of domain GDT-TS scores and the whole chain GDT-TS score) are shown above the plot. Duplication of SH3-like barrel fold, clearly homologous to C-terminal domain of transcriptional repressors superfamily. Whole chain: Fold recognition, as just a couple of servers predicted the domain arrangement correctly. 1st domain: Comparative modeling:medium; 2nd domain: Comparative modeling:medium, small deviations from the template throughout the structure lower server scores. Ferrous iron transport proteins A (FeoA): e.g. 2gcx, 1fx7. T0462 is a duplication of this domain. NMR models contain the C-terminal His-tag residues 155-LEHHHHHH-162, not present in the target sequence. This regions was removed from NMR models due to disorder anyway. Each duplicate is a FeoA domain family PF04023 in Pfam. This protein is a close homolog of T0492 on each duplicate. First models for T0462: Gaussian kernel density estimation for GDT-TS scores of the first server models, plotted at various bandwidths (=standard deviations). The GDT-TS scores are shown as a spectrum along the horizontal axis: each bar represents first server model. The bars are colored green, gray and black for top 10, bottom 25% and the rest of servers. The family of curves with varying bandwidth is shown. Bandwidth varies from 0.3 to 8.2 GDT-TS % units with a step of 0.1, which corresponds to the color ramp from magenta through blue to cyan. Thicker curves: red, yellow-framed brown and black, correspond to bandwidths 1, 2 and 4 respectively. First models for T0462_1: Gaussian kernel density estimation for GDT-TS scores of the first server models, plotted at various bandwidths (=standard deviations). The GDT-TS scores are shown as a spectrum along the horizontal axis: each bar represents first server model. The bars are colored green, gray and black for top 10, bottom 25% and the rest of servers. The family of curves with varying bandwidth is shown. Bandwidth varies from 0.3 to 8.2 GDT-TS % units with a step of 0.1, which corresponds to the color ramp from magenta through blue to cyan. Thicker curves: red, yellow-framed brown and black, correspond to bandwidths 1, 2 and 4 respectively. First models for T0462_2: Gaussian kernel density estimation for GDT-TS scores of the first server models, plotted at various bandwidths (=standard deviations). The GDT-TS scores are shown as a spectrum along the horizontal axis: each bar represents first server model. The bars are colored green, gray and black for top 10, bottom 25% and the rest of servers. The family of curves with varying bandwidth is shown. Bandwidth varies from 0.3 to 8.2 GDT-TS % units with a step of 0.1, which corresponds to the color ramp from magenta through blue to cyan. Thicker curves: red, yellow-framed brown and black, correspond to bandwidths 1, 2 and 4 respectively.